The pharmaceutical CEO, who recently hiked the cost of an AIDS drug, had hoped to parlay his contribution into a private meeting with the presidential candidate. 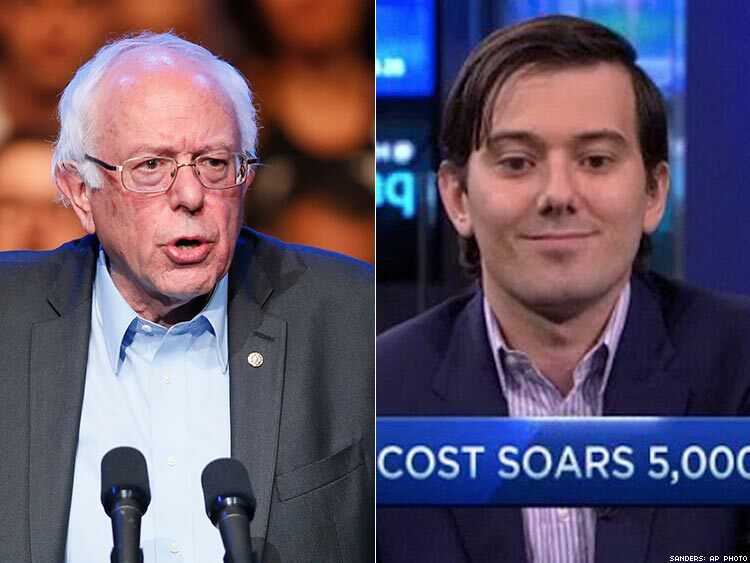 Bernie Sanders has refused to accept the donation of a pharmaceutical CEO who controversially raised the price of an AIDS medication. Instead, the presidential hopeful has donated the sum — $2,700, the maximum amount allowed from a private donor — to Whitman-Walker Health, a Washington, D.C.-based clinic that specializes in the treatment of HIV patients and the LGBT community, reports the Boston Globe. “We are not keeping the money from this poster boy for drug company greed,” said Michael Briggs, the campaign spokesperson of Sanders, about the donation from Martin Shkreli, the CEO of Turing Pharmaceuticals. Shkreli made headlines in September when he hiked the price of Daraprim, a vital part of treating toxoplasmosis (which disproportionately affects patients with HIV and AIDS), by more than 5,000 percent, from $13.50 to $750 per pill. Sanders, a Democratic candidate who is an outspoken opponent of “Big Money” and an advocate for lowering drug prices, joined the many voices, including Hillary Clinton, who decried Shkreli’s actions. “I would lump Wall Street and the pharmaceutical industry at the top of my list of people who do not like me,” he said during Tuesday night’s debate of Democratic presidential candidates. During this time, Shkreli tweeted about his donation, which was made September 28. Shkreli has defended the price hike, maintaining it is a necessary increase that will support research and development for a better treatment. An unlikely supporter of the 74-year-old liberal, he says he made the donation in the hopes of obtaining a private meeting with the Vermont senator, in order to explain his position. He is also not pleased with how Sanders responded to his donation. If @BernieSanders doesnt want my $, he can send it back to me. Keeping it & then donating that amount to charity means he still accepted it. In his interview with the Globe, Shkreli expressed an even less favorable view of Clinton, saying, “I don’t think she really stands for anything.” But the former secretary of state also had sharp criticism for the 32-year-old CEO at a recent Human Rights Campaign gala, in which she made several key promises to the LGBT community. “Now with pressure from me and others, the CEO of the drug company says he'll lower the price, but he hasn't done it yet, and every day that he stalls, people with HIV are forced to worry and wait, and pay hundreds of dollars more, for medication that keeps them well,” she said. “That is wrong, and as president, I'll take on the drug companies, I'll cap out-of-pocket expenses for people with chronic diseases like HIV/AIDS."